So the boyfriend and I have been buying pre-made Wheatberry Salad at our local grocery store’s deli counter, and finally decided we could do it better ourselves — and healthier and cheaper, too! There is definitely less sugar in our version than the store-bought one, and a much higher veggie-to-grain ratio. We like it that way. I think this is definitely going to be a new staple around here, especially for the summer months. For those of you scratching your heads in wonder in the bulk aisles: the wheatberries we picked up are hard winter wheat, higher in protein than the soft wheat varieties. Prepare Wheatberries: In a pot over high heat, bring water to a boil. Add wheatberries and bring back to a boil. Reduce heat to a simmer, and let cook for 45-50 minutes or until tender. Drain and let cool. 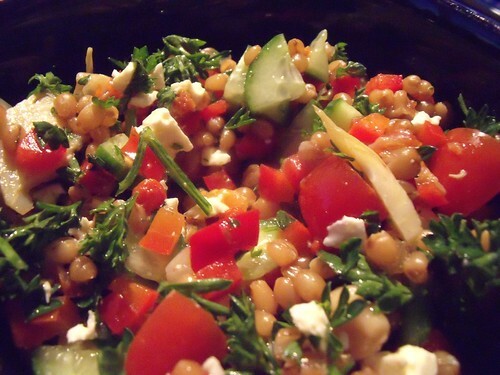 Combine Salad: In a large bowl, combine cooked wheatberries with Veggies & Tasty Add-Ins. Mix Dressing: Mix dressing ingredients in a small bowl. Check that you like the flavours, and adjust if necessary. When ready to serve, toss salad with dressing and enjoy! This looks great, as usual….thanks! I luv wheatberries but admit to eating them mainly as a morning meal, same as porridge. Will definitely give this a go….Hugs! Beautiful! But what are wheatberries? I don’t think I’ve ever had them before. What do they taste like? I’d love to adapt this salad maybe using something I can find in Mexico. Wheatberries are the whole (but hulled) wheat kernel… you grind them to make wheat flour! I bet you could make a similar salad with any other grain… brown rice would be quite similar in texture/taste/size, smaller grains like quinoa or couscous could also be yummy! What grains are easy for you to get in Mexico? Inquiring minds now want to know! I do miss some of the more toothsome grains, like bulgur. Will have to try to smuggle some back during my next trip to the States. I must say, you’re only allowed to complain about grains if you send me all the good stuff: papaya, mango, plantains, oooooooooooh the avocados. And your lemons! How do they taste like that?! 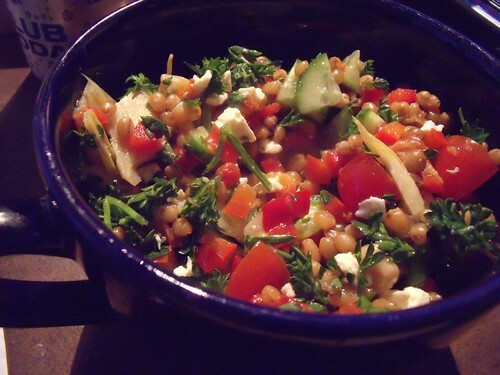 Will make today!—just happen to have some wheatberries in the cupboard…. YAY! I think you’ll love it. You can also cut down on the cooking time by soaking the wheatberries in advance… I haven’t experimented with that yet, but it seems to be the recommendation in most books. I’d love to hear how it turns out for you!